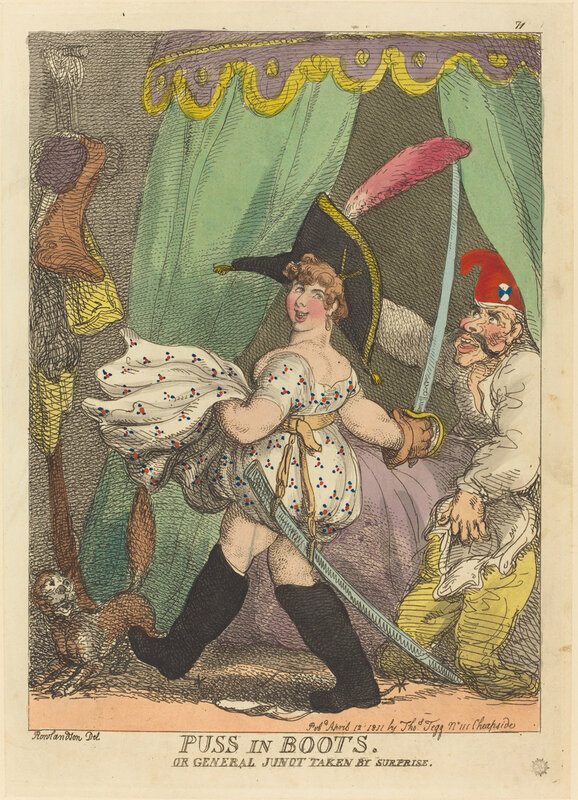 Believe it or not Puss in Boots, or General Junot Taken by Surprise is part of Thomas Rowlandson’s collections of satirical prints about Napoleon. Confusing, I agree, as Napoleon is found nowhere in the print. Instead we see a young girl marching around in boots with a sword and a shocked General Junot, who has been stirred upright from bed, trousers in hand. “I well recollect that on the day when he first put on his uniform, he was as vain as young men usually are on such an occasion. There was one part of his dress which had a very droll appearance–that was his boots. They were so high and wide that his little thin legs seemed buried in their amplitude. “Young people are always ready to observe any thing ridiculous; and as soon as my sister and I saw Napoleon enter the drawing-room we burst into a loud fit of laughter. 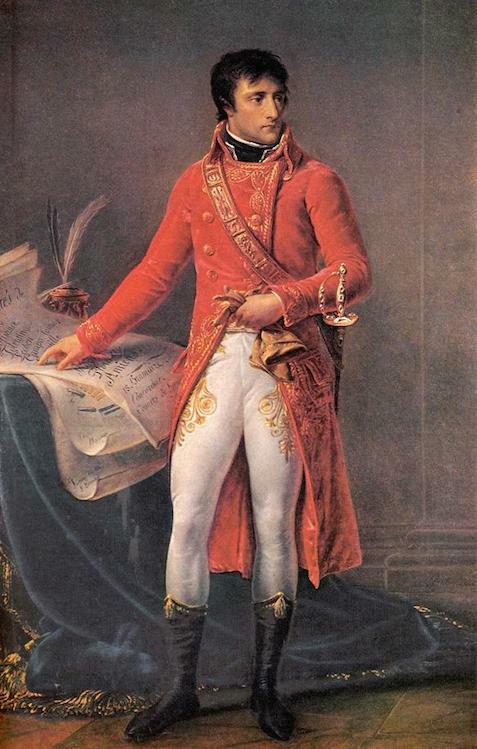 At that early age, as well as in after life, Bonaparte could not relish a joke; and when he found himself the object of merriment he grew angry. My sister, who was some years older than I, told him that since he wore a sword he ought to be gallant to ladies, and, instead of being angry, should be happy that they joked with him. Which brings us full circle to why Rowlandon’s Puss in Boots print is part of his Napoleon collection. Mystery solved for today! If any of you come across a Rowlandson print that wants explanation and doesn’t appear readily available, send it my way. I might just be inclined to spent an afternoon looking it up. That was a great story! This historical stuff is awesome! Well done. I love this story! But poor Josephine. Oh, I know! No woman likes less than flattering comments about her appearance, then or now. She was definitely sore about some of his teasing but she also tormented him in their earlier years together.